When you go to a Social Security disability hearing, you either win disability benefits, or you lose the case and get no benefits. At least, that’s what the general public may believe. In practice, there’s an entire area in between these two extremes, called the “partially favorable decision.” Whether such a decision is something that is in your best interest, is an individual choice based on your circumstances. When you apply for disability benefits, the judge is not just determining your right to ongoing disability payments in the future, but also deciding on whether you will receive any back pay. For people whose applications have languished in the disability system for years, an award of back pay can be a significant lump sum dollar award. Unlike continuing benefits, back benefits are based on how many payments you have made into the system through paying taxes. 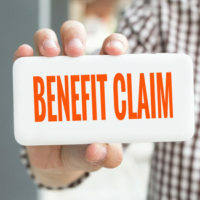 Assuming you have paid taxes (i.e., you weren’t paid in cash “under the table”), then what your recovery for back benefits depends upon whether you were disabled at the onset date of your disability, i.e. when you last worked, but no further back than 1 year before you actually applied for benefits. There is also a 5 month waiting period after the onset date when no benefits can be awarded. An ALJ will determine whether you were disabled at the onset date or a subsequent date as a “partially favorable” decision. If you disagree, you must appeal within 60 days. At first, this may seem OK—as long as they’re agreeing to pay you monthly, who cares when the onset date is? But in fact, changing that onset date can cost you a lot of money. Let’s say it is Feb. 1, 2019 when you apply for disability. You are awarded benefits on Feb 1, 2021. In your application you say that your onset date is Feb. 1, 2017. If you win, you would be entitled to the year before the application, plus the two years from application to award, minus the 5 month waiting period, for a total of 31 months of benefits. But with the same hypothetical facts, let’s say the judge thinks your disability onset should be Jan. 1, 2020. Subtracting the 5 month waiting period, you now have been cut to 8 months. Assuming that you don’t agree to change or amend your onset date, you can appeal an onset date changed by Social Security, but you need to consider whether risking you benefits for just a few months of lost benefits is worth it. If you are happy with the monthly award going forward, you may not want to risk losing it to appeal just a few months of lost benefits. But if your case has been toiling in the system for years, and you have been deprived years of payable benefits, it may be worth filing an appeal. Make sure your social security case is handled by attorneys who can give you guidance at every step of the application process. Contact us at the Celeste Law Firm in West Palm Beach today for help with your Social Security disability case.